Secretary of Education Betsy DeVos was hit with two separate but similar lawsuits on Thursday, both concerning student debt relief claims. California Attorney General Xavier Becerra (D.) sued DeVos and the Department of Education for failing to process more than 50,000 debt relief claims by former Corinthian College students. On the same day, the attorneys general of Massachusetts, New York, and Illinois, all Democrats, filed a separate lawsuit alleging that the Trump administration is violating federal law by refusing to hand down decisions on pending claims, the Washington Post reported. The Department of Education has been inundated with applications from former students of Corinthian Colleges and ITT Technical Institutes, both defunct for-profit chains, who are hoping for their federal student loans to be forgiven. The department can discharge federal student loans under a federal statute, known as the borrower defense to repayment, when colleges use illegal tactics to persuade students to borrow money. In 2015, an investigation found that Corinthian misrepresented job placement rates for graduates of its Everest and WyoTech schools, and the Department of Education, then under the Obama administration, agreed to expedite loan discharges for students who attended those schools. No claims have been approved since President Donald Trump took office in January. 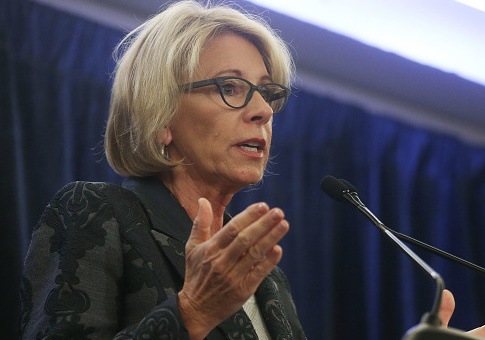 "It's time for Secretary DeVos to do the work that was done by the previous secretary of education to help students seeking debt relief," Becerra said on Thursday. "We know that the department is holding a pot of money that was made available through the settlement of lawsuits to provide relief to these students." The Department of Education's inspector general said this week that, while the procedure for processing claims could be improved, the system works well enough that there is not a good excuse for the department not to clear the backlog of claims. Attorneys working on the applications have flagged almost 12,000 for approval and about 7,200 for denial. Wayne Johnson, head of the student aid office, told the inspector general that the discharge of some of the claims for approval is "imminent." Acting Under Secretary James Manning has refused to sign off on the claims because the Trump administration needed time to review the policies put in place by the Obama administration, according to the inspector general. Applicants awaiting pending claims are currently accruing interest on their loans, while many have placed their loans in a grace period they can extend while they wait for approval. "Students will never be made fully whole for their experiences at these schools, but this is what they're owed under federal law," Massachusetts Attorney General Maura Healey said Thursday. "We're going to keep continuing to fight as long as the department ignores its obligations, and ignores what is right." This entry was posted in Issues and tagged Betsy DeVos, Department of Education, Inspector General, Lawsuit, Student Loans. Bookmark the permalink.